Before the fountain shows, pool parties and endless buffets of the Strip, Fremont Street ruled the gaming and entertainment landscape in Las Vegas. 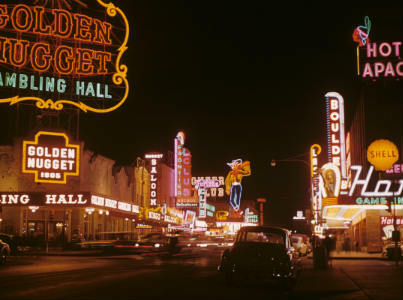 Known as the Glitter Gulch in its heyday, its iconic neon signs were the face of Las Vegas up until the 1960s. Not only was Fremont Street the first paved road in the city, it was also home to Las Vegas’ first traffic light, casino and high-rise hotel. While Fremont Street has gone through many ups and downs, visitors would be wrong to relegate it simply as second fiddle to the Strip, which is located just 2 miles to the south. Fremont Street and the rest of Downtown Las Vegas offers an exciting experience that’s unique to anywhere in the U.S. For many tourists and locals, its old-school charm is more enticing than the glitz glamor of the Strip. Simply put, no trip to Vegas is complete without a visit to Fremont Street. Named after noted explorer John Charles Frémont, Fremont Street was an important Las Vegas hub even before gambling was legalized in Nevada. But when the Northern Club on Fremont Street was issued the state’s first gaming license in 1931, the street’s fortunes began to change. Soon after World War II, the five block stretch of Fremont Street between Las Vegas Boulevard and Main Street was home to a cluster of modern casino resorts. Some of these, including the Golden Gate, Las Vegas Club and Golden Nugget are still open today. 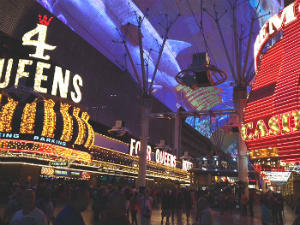 The street’s fortunes began to change again after 1994, when that same five-block stretch was converted into the Fremont Street Experience. This project resulted in the road being closed to automobile traffic and converted into an outdoor pedestrian mall. The area was covered with a 1,500-foot long barrel vault canopy with a massive display screen. The project marked the beginning of a major revitalization of Fremont Street. The 2010s have seen even more investment being poured into the area as many attractions, restaurants and casinos have been renovated or added. Surprisingly, many first-time Vegas visitors don’t realize that Downtown is a separate district from the Strip. Some may even think the Strip is Downtown. Of course this is not true. With street performers, outdoor vendors and nightly live music, Fremont Street has an entirely different vibe. The downtown hotels are older and smaller, but they are less expensive and closer together. Guests can walk from casino to casino in just a matter of minutes. Many gamblers prefer Fremont casinos because they generally offer better odds and lower blinds/minimum bets on table games. There’s a greater mix of locals with tourists and fewer establishments that require a dress code. In many ways, the atmosphere is more carnivalesque. In a typical walk down Fremont, one may see families, hipsters, average Joes, hard partiers and older gamblers beside street performers dressed like Spock from Star Trek or classic Vegas showgirls. 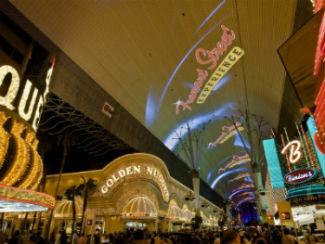 Fremont Street is further broken down into two distinct districts: Fremont Street Experience and Fremont East. FSE is on the far west end of Fremont Street and spans five blocks from the Plaza Hotel & Casino across Main Street to the Neonopolis shopping complex at Las Vegas Boulevard. The majority of downtown’s foot traffic is clustered within the FSE area, which includes all of the street performers and most of the “classic” downtown casinos. Since this part of the street is open to pedestrians only, one can easily walk to and from casinos on either side of the street. The most visual distinction of the FSE district is the 90-foot high Viva Vision Canopy, the world’s largest video screen. The canopy, which was made with 12.5 million LED lights and a 550,000-watt sound system, plays light shows periodically every night. During these shows, which last around six minutes, the lights of all the surrounding casinos are turned off, giving pedestrians a better view. In total, nine of the downtown casino district’s 14 casinos are within the Viva Vision canopy. Aside from the casinos, visitors will find various gift shops, convenience stores (including a Walgreens), street vendors, bars, restaurants and one gentlemen’s club within FSE. Some casinos have bars located outdoors along with seating, which allows for excellent people-watching. FSE is well known for offering live outdoor music and performers on a nightly basis. There are three stage areas in the district, which may host local cover bands or national acts. It’s not uncommon for these areas to get especially packed when big-name bands take the stage for the FSE free concert series. For an overhead view of FSE, one can indulge in the Slotzilla Zipline attraction. This slot machine-inspired thrill ride lets riders “fly” 10 stories high through the pedestrian mall. Even if you don’t ride Slotzilla, you can still enjoy watching screaming riders whirling above on the zipline. Much of the most recent downtown renovations have been made to Fremont East, a six-block entertainment district adjacent to the Fremont Street Experience. 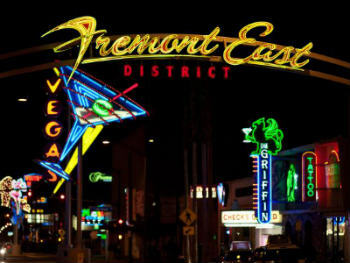 Since being created in 2002, Fremont East has vastly improved and gained in popularity among locals and tourists. The district, which runs from Las Vegas Boulevard to 8th street just past Container Park, features trendy bars, cocktail rooms, eateries, sidewalk cafes, live entertainment venues, vintage neon signage and local businesses. Unlike FSE, Fremont East is not closed to automobile traffic. However, the area is still pedestrian friendly as police frequently roam the area. 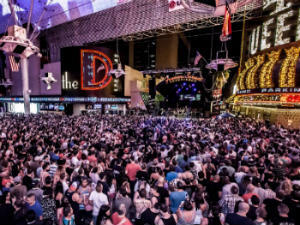 The crowd on Fremont East is generally a younger (20s - 30s), and the most popular activities are to bar hop or catch live bands at venues like Beauty Bar or Backstage Bar & Billiards. Drink prices on Fremont Street are much more reasonable than on the Strip. In total, there are 15 bars in this area. They range from dark speakeasy-inspired pubs (the Griffin) to retro video game nightclub (Insert Coins) to sophisticated lounges (Downtown Cocktail Room). One casino, the classic El Cortez, is located in the district. On the east end of the district is Downtown Container Park, an outdoor attraction featuring boutique shops, restaurants and a giant tree house that can be enjoyed by adults and children. True to its name, Container Park was built with various shipping containers and spans 19,000 square feet. The entrance is marked by a 55-foot tall metal praying mantis that shoots flames from its antennas. While most streets in Las Vegas are set up on a grid, Fremont Street runs diagonally northwest and southwest. Unlike the Strip, which is technically located on unincorporated county land, the Fremont Street is actually located within the city limits of Las Vegas. Even though the casino district is only 2 miles north of the Stratosphere, it's generally not recommended to walk to it from the Strip. Tourists staying on the Strip can access Fremont Street via taxi, which could run $15 - $25 one way, or the convenient Deuce bus system, which runs 24 hours and costs $6 for a full-day pass. There are several parking decks located on or near Fremont Street, but they are not as plentiful and spacious as the garages on the Strip. For this reason, many fill up on weekend nights and/or charge a parking fee (usually $5). Some hotel decks will waive the fee if you get your tickets validated in the casino. On Fremont East, meter parking can be found on side streets, but these spaces fill up very fast. Free deck parking can be found at the Four Queens, Binion's and The D.